The Atletico Madrid forward buried the hatchet with the defender following Saturday’s Madrid derby in La Liga. ANTOINE GRIZEMANN SAID he has a lot of respect for Sergio Ramos after the Real Madrid captain publicly questioned the Atletico Madrid star’s ambition. Ramos urged Atletico head coach Diego Simeone to teach Griezmann some “values” after the Frenchman and World Cup winner talked up his Ballon d’Or chances. 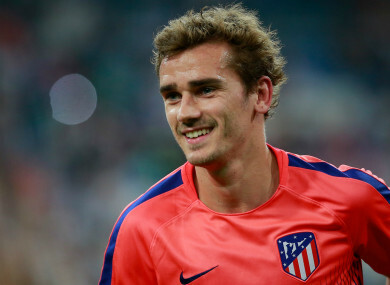 Griezmann claimed he is on the same level as Barcelona superstar Lionel Messi and Juventus’ Cristiano Ronaldo, prompting a response from the Madrid skipper. Atletico forward Griezmann and Ramos went head-to-head in Saturday’s Madrid derby, which ended goalless at the Santiago Bernabeu. Asked about Ramos afterwards, Griezmann said: “He’s my little friend, I have a lot of respect for him. “He’s an example for the kids and a great centre-back. “For me, this is a game, I like to have fun with my team-mates and with players from other teams. Barcelona and Madrid are level on 14 points atop the La Liga table, two points ahead of fourth-placed Sevilla. Email “'He's my little friend': Griezmann plays down spat with Real Madrid ace Ramos”. Feedback on “'He's my little friend': Griezmann plays down spat with Real Madrid ace Ramos”.